I bought this Ibis Mojo as NOS from American Cyclery in San Francisco, after Eric H. discovered this gem and informed me about it. 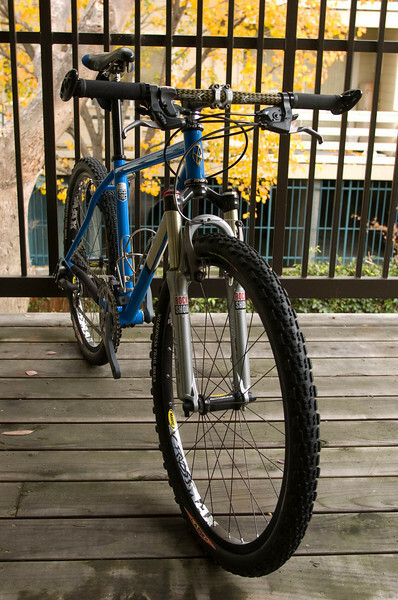 With parts donated from Fong T., the Ibis was built up to its current specification as a mostly 950-series XTR race bike. Unfortunately, I don't race anymore, nor do I really mountain bike much, so the Ibis sits on a shelf, all cleaned and tuned, waiting for an opportunity to go for a spin. Y2K Ibis Mojo with "Moron" tubing.